Kindness, that pleasant disposition that brightens up someone’s day, is slowly fading away as more and more people are taught to become independent and self reliant. Contrary to common belief, kindness is not a sign of weakness. It’s a strength that only a handful of people are able to cultivate because being kind takes a lot of love in oneself that’s being radiated unto others. In a world that’s hurting from the inside out, giving kindness in your own little way means a lot. Kindness is also contagious. When you show kindness to others, they’re likely to pass it on. Being kind is as simple as giving a smile to the sales clerk who greets you as you enter the store or to the stranger you meet along the street. 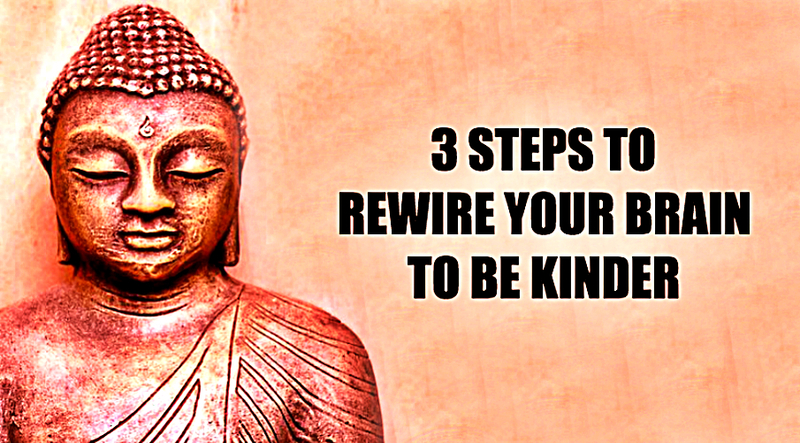 However, if you’ve forgotten how to be genuinely kind, you can rewire your brain to become kinder once again. Just follow the suggestions below and start being kind. 1. Be kind to yourself first. You can’t give what you don’t find within. Kindness should start with yourself. The relationship you have with others mirrors the relationship you have with yourself. Your ability to be kind to yourself can be seen on how kindly you talk to yourself or hold yourself. By creating messages of kindness, you’re powering up your vagus nerve, the longest nerve that connects the brain to the heart, gut, and other body parts. You can tone and strengthen this nerve by purposely giving yourself thoughts of kindness and positivity. 2. The magic of touch. Human beings are hardwired to respond positively to a loving and comforting touch. This touch does not have to always come from another human being. The touch on your skin of a warm shower is soothing. Even petting your animal benefits you both. When in the shower, give your body a gentle touch as you lather the soap all throughout. This creates a habit that enhances your compassion for yourself and ultimately for others. 3. Soak yourself in the kindness that surrounds you. Allow yourself to be vulnerable and get lost in the loving embrace of your child, your spouse, or your friend. Be truly present as someone smiles or gives you a warm touch. Give your focus to the things that create a positive and uplifting experience. Involve all your senses in the process because this is the best foundation that offsets any negativity imprinted in your brain. Doing this every day fills your memory bank with thoughts of compassion and kindness until being compassionate and kind becomes the default configuration you use. Take note, when you’re kind enough to help others, it stimulates the area of your brain called striatum, which is a critical component for the motor and rewards system. Thus, when you’re being kind, you emit a “warm glow”.